Classical Greece at your own speed! Here’s a great combination of guaranteed accommodation with freedom to explore. With your private car for the entire week, you’ll have four days during which to discover and explore all of the magnificent sites that we call Classical Greece. This is ideal for people who prefer the flexibility to do things on their own and at their own speed. But, as your accommodation is pre-selected and guaranteed, you won’t have to waste any of your precious time trying to find a place to sleep at night! “No room at the inn?” Not with Windmills! Arrival at Athens International Airport. Pick up your car from our representative and drive to your hotel. 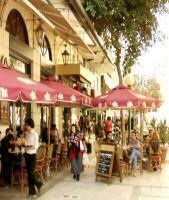 We suggest you visit the Old Part of town, Plaka, and eat at the traditional tavernas. Overnight Athens. Day at leisure. 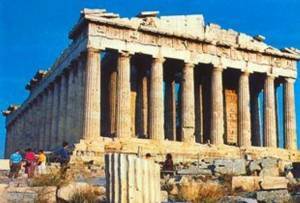 You can explore the city on your own, or take an optional Athens sightseeing tour. Use your car to drive outside the city to one of the nearby beaches, visit Sounion to watch the sunset, or simply drive along the coastline to enjoy the scenery. Overnight Athens. After breakfast, drive to the city that you prefer - Nafplion, Olympia, Delphi, or Kalambaka. Stay from one to four nights in the city of your choice. For these days you may choose the cities of your choice to visit. Enjoy the independence of this itinerary. Discover the ancient cities, full of history, and surrounded by magical landscapes. You may arrange optional sightseeing tours, or just explore on your own. Breakfast will be served daily at your selected hotels. After breakfast, drive back to Athens for your last overnight in the city. If you have last-minute shopping, now is the time to explore the shops on Ermou Street, or in Monastiraki or Kolonaki. Overnight Athens. After breakfast, drive to Athens International Airport for your departure flight. Drop off your car to our representative. Special Note: If you prefer an escorted tour of Classical Greece, please refer to our itinerary for "Kalliope."